Found 7 file extension associations related to Booria Carpet Designer and 1 file format developed specifically for use with Booria Carpet Designer. Booria Carpet Designer is the most advanced carpet design software, which is able to meet all demands of professional carpet and rug designers. 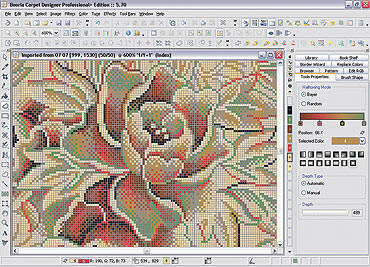 This advanced carpet designing software is coming with flexible and comprehensive set of drawing tools and a great range of functions and features, which are increasing design productivity. If you need more information please contact the developers of Booria Carpet Designer (Booria CAD/CAM Systems), or check out their product website.